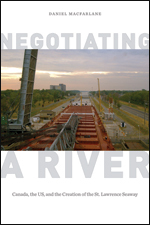 In his work Negotiating a River: Canada, the US, and the Creation of the St. Lawrence Seaway, Daniel Macfarlane recounts the policy, negotiations and later impacts of the creation of the St. Lawrence Seaway. The comprehensive detail of his research and depth of analysis sheds important light on Canada and its technological advancements in the twentieth century. In the forward of the book, Graeme Wynn sets the stage for Macfarlane’s message “The realization of powerful, brute-force technology deployed when high modernist confidence in the value of transforming nature for human purposes met few challenges” (xiv). This is overwhelmingly evident through the duration of the book as Macfarlane weaves through the mounds of negotiating politics that brought central Canada the St. Lawrence Seaway. However, despite his detailed examination of the evolution of this project, at times the human element and impact of the seaway feels missed in the chronology of politics, policy and presumptions from the major players. This seems though, to be somewhat fitting as the St. Lawrence was also at times, lost in a myriad of complications. The St. Lawrence Seaway was built between 1954-1957 after decades of cooperative efforts to combine navigational and hydroelectric power (5). The seaway was constructed as a series of navigational works such as channels, dams and canals and runs 291 kilometres from Montreal to Lake Erie. It was hailed at the time as a ‘zipper’ for Canada/US relations in the midst of the Cold War, a cultural conception of nature, water and technology as important determinants of Canadian foreign policy (11). Conversely, the St. Lawrence Seaway also brought about the largest rehabilitation project in Canadian history. Approximately 6,500 people in Ontario and 1,100 people in upstate New York were forced to re-locate for the greatest engineering accomplishment in the 20th century (7). Macfarlane illustrates the magnitude of the project in both qualitative and quantitative terms. Throughout the first half of the book, Macfarlane explains the multiple series of treaties, commissions, and campaigns that plagued the development of the seaway following the Second World War. It is clearly evident for readers that the policy surrounding the construction of the seaway navigated slowly for decades prior to its breaking ground. From the Great Lakes Waterway Treaty in 1932 through to the 1941 Great Lakes-St. Lawrence Basin Commission and beyond, readers are given the opportunity to appreciate the truly painstaking evolution of the technological marvel. “The seaway experience marked a major turning point in the history of both Mohawk communities. In Canada, it marked the end of their trust in the federal government and gave rise to a more radical nationalist movement that led to later Mohawk conflicts with the Canadian and American states” (128). A statement as significant as this one deserves to be unpacked. Negotiating a River: Canada, the US, and the Creation of the St. Lawrence Seaway by Daniel Macfarlane offers to readers a thorough account of the construction of the St. Lawrence Seaway. The work is evenly divided between the political/policy of the construction, and development/human effect of its eventual finishing. Macfarlane’s work illustrates the multiple players involved and the immense amount of minutia and time the St. Lawrence Seaway took to complete. Although the policy and procedures of the project are well researched and depicted, more attention to the narrative of the First Nation communities impacted by the seaway could have been included. The St. Lawrence Seaway became a symbol of self-confidence in addition to prosperity, a technology as a cause and effect of nationalism (78). Macfarlane portrays how Canada used water as a commodity, and valued it for what it could become: power. Natalie Zacharewski holds a Master of Arts in American History from the University of Ottawa. She currently works in the museum field in Edmonton, Alberta.